Casestudyhelp.com have 3000+ CDR expert writers who are well experienced in writing with 10+ years of experience and provide CDR writing help for all needs like- CDR Report Writing, Career episode writing, RPL report writing, KA02 writing and more. Apart from these services, the CDR writers provide CDR migration services in all countries for both professional engineers and student engineers. Some popular countries are- Australia, UK, USA, UAE, Malaysia, Singapore and more. How to get the Best Services from the Top CDR Writers Australia? CDR (Competency Demonstration Report) is the gateway for the talented and experienced engineer from all across the world to live and work in Australia at reputed companies in the position of engineers. 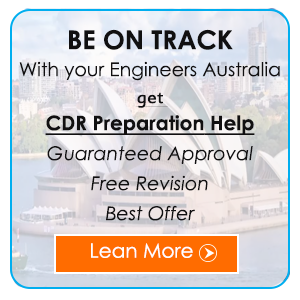 You always need the best online CDR writing services from a trustworthy provider in the sector since the foreign engineers do not have adequate knowledge about the latest guidelines set by the Engineers Australia (EA) team who are the CDR selectors. The EA assessors test how competent the engineering applicant is to live and work in Australia in any technical discipline. Each of them needs to apply under a unique ANZCO code for the CDR application. The casestudyhelp.com is always the best name for you when it comes to your CDR Engineers Australia writing help services. What is a CDR (Competency Demonstration Report) is? Core technical or engineering knowledge and competencies to support the occupation under mentioned engineering discipline. The demonstrated application of the technical knowledge in the nominated conception category. You always need to follow the EA (Engineer Australia) guidelines while writing the CDR report. The CDR report is to be done by using the Microsoft word processor and should be your own original work. Writing Personal Information: All the personal information includes your name as well as personal identification. You also need t to submit a passport size photograph great other related documents along with your CDR application. You also need to enclose your updated resume. You can get a good idea regarding the documentation from your free online CDR Writing Samples on our website. Making the Application: here you need to nominate the occupation category under which you are making the application. Attach the Education Certificates: These include all the transcript, certificates as well other relevant documents. Specify your Employment Skills: You always need to provide all the required evidences regarding your previous jobs. The EA assessor will measure your related skills and experiences in this way. Writing the Report: This is the place where you’re Career Episodes, Summary Statement and the CPD statement is provided. The Final Submissions: You always nee o offer a professional touch in your CDR report before the final submissions. Therefore, availing the best online CDR report help from Casestudyhelp.com is always the best option for you. Our assessment writing services online assure you of a hundred per cent selections by the Engineers Australia (EA) assessors. We have helped to the large number of engineering aspirants from various parts of the world of making their dreams come true of living and working in Australia. They are e all very happy and satisfied with our services. Thus, join us by registering on our official or main website Casestudyhelp.com.